Tony Hill - "Inexactness" / thebrotheregg - "Snowflake & Fingerprint Machine"
Britain's Woronzow Records, under the direction of Bevis Frond stalwarts Nick Saloman and Adrian Shaw, has lately been coaxing some close friends and relations into their fold and have produced a host of top shelf psychedelic guitar-rock discs as a result. Here's a new pair they've offered into the marketplace, and at least one of these follows suit. Hide Tide is one of those fondly remembered bands from the old days of the Roundhouse and other legendary venues of the late '60s London scene. At least from those who actually remember them at all, many of them being us Hawkwind fanatics from around the world who worked backward upon Simon House's addition to the Hawk lineup in the mid-70s to discover from whence he came. One Pete Pavli (Hide Tide's bassist) eventually also developed an additional Hawkwind connection as he was involved with Michael Moorcock's Deep Fix. 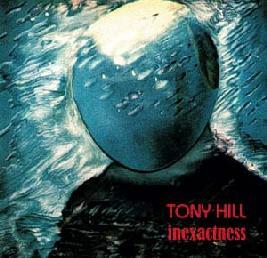 But High Tide was really Tony Hill's band, and after discovering (by way of his two track contribution to the recent Acid Jam 2 CD package, also on Woronzow/Rubric) that he was still producing music these days, it was no surprise to me to see this new solo work entitled 'Inexactness' appear. I say 'solo' work, and granted writing nearly all the music himself as well as being both the primary guitarist and sole vocalist makes this truly a 'Tony Hill' product, but honestly I've seen other musicians that have re-claimed the names of their old bands (sometimes at the request/demand of their labels) with less justification. One reason is that Pavli came back to play bass on three of the nine tracks (Shaw coming by to fill in on the others)... the other reason is that while Simon House was apparently not around to contribute his signature violin-playing, Hill enlisted a suitable replacement in Matt Kelly. Andy Ward (Camel, Bevis Frond) plays drums on all the tracks (wonder where Roger Hadden is these days? ), and knowing that he went through a bad stretch not long ago, it's good to see that he's back at it again. 'Inexactness' is roughly 50 minutes of blinding guitars, 'nuff said. Hill and Saloman are a dangerous pair, and when they're both going full bore, they're a two-headed monster. Of course, you can't tell who is who, but if I had to take a guess I'd propose that Hill hangs out mainly in the left channel, Saloman in the right (unless I put my headphones on backwards, that is). The mellow and dreamy title track is the one place where some quieter jangly guitar comes to the fore and some nice synth touches are thrown in as well, so its place smack dab in the middle of the album was a good way to change things up midstream. On either side are a number of strong hard-drivin' riffs, including "But There Again" and "Positively Negative," each summoning up images of the contorted facial expressions trademarked by Robin Trower - and his guitar too. Hill's singing voice is solid enough and appealing, but he hardly projects over the top. And on tracks like "Lineage," he is particularly laid back and cheerful. Before we even get to the vocals though, Hill demonstrates true compositional skill juggling both the dirty and melodic guitar styles in amongst the violin passages. "I Don't Want To Talk" provides the first Hill/Saloman guitar duel (an excellent tune! ), but the relentless instrumental "Of Foundries, Ships, and Steeples" is a psych-guitar jamfest of epic proportions. If you've heard Acid Jam 2, you know what I'm talkin' 'bout! Kelly tries valiantly to muscle his violin in edgewise, but let's be real - this one is all about guitars! 'Inexactness' winds down with the slower and more sullen piece entitled "Six Million Years," and the general theme of the lyrics dealing with human suffering seems entirely appropriate for September, 2001. The rhythm section is solid and steady all along - no surprise there, a bunch of true professionals. 'Inexactness' is on par with most High Tide material of the past in my opinion, and anyone who never tires of hearing excellent fretwork in conjunction with occasional footwork (i.e., wah pedals), here's one to look out for. Alright, I haven't had the opportunity to be critical of many new albums lately (certainly a good thing! ), which might begin to make me seem a little 'soft' on marginal stuff. So I'm probably going to be a little harsh on this next one, (what I assume is) the debut album by the quintet thebrotheregg from Portland, OR. 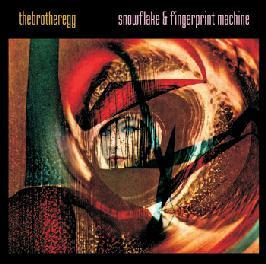 'Snowflake and Fingerprint Machine' is a collection of a dozen songs all out four minutes in length, and all come across as half-hearted attempts at taking ordinary pop songs and throwing in a psychedelic touch here and a bit of proggy complexity there. I didn't bother to count the number of times that the band used the breathy, distant, and muffled vocal effect - nearly every song I think. And whether the sheet music reveals a 3/4, 6/8, or 3/8 time signature I can't say, but a great deal of the tunes are sappy ballads (rock's answer to the waltz) with that swaying triplet feel. Combined with the flaccid harmony vocals, I can't find much joy in this listening experience. Oddly then, one track I enjoyed somewhat was exactly an example of these cliché-ridden ballads, a shoegazing dreamscape entitled "Telescope." Here, as for most of the album, the foundation is supported upon an acoustic stand-up bass, which is certainly unusual for this sort of music, but not really a reason for any great applause. Oh, there's a bunch of other things they try, guests coming by to play a trumpet here, an accordion there, a gosh darn bassoon for chrissakes, but none of it really makes much difference. The only composition that showed any imagination was the finale "Cauldron of Eyeball Soup" with its stream-of-consciousness lyrical style and superior attempts at dynamics. This one must be at least as good as what the Hogarth-fronted Marillion is putting out these days. The rest of the album? "Negative Space," "Futuristic," "Omniuniminiverse"...intriguing titles? Maybe, but just ordinary songs. In summary, 'Snowflake' is Radiohead on Prozac (or Zoloft, if you prefer that particular mood-enhancing medication), not dreary in style but dreary in imagination. If 'Lightbulb Sun' was your favorite Porcupine Tree album, then perhaps this album for you. But if you're a hard-core psychedelic rock fan, I'm pretty sure you'd be best served by looking towards Tony Hill's gritty guitar fest instead. My faith in the excellent Woronzow label is not going to be threatened by this single failure. But if this is an intended start toward a new influx of younger artists with a presumed mass appeal potential, I'd recommend a guarded approach and a continued commitment to those within the 'inner circle' of Woronzow. I have no doubt that will be maintained. Woronzow resides online at http://www.woronzow.co.uk and Rubric in the US is at http://www.rubricrecords.com. I think thebrotheregg is slated for November release on Rubric. Hill's is already out on both labels.